Wisconsin entered this game with an undefeated season and playoff hopes in their suitcase. A victory over the Buckeyes would secure a playoff spot for the Badgers. Ohio State was looking for another Big Ten championship and possible playoff berth themselves. The noise and nervousness was palpable inside Lucas Oil Stadium as these two conference contenders clashed for the championship. Camp Randall Stadium is one of the most raucous stadiums in the nation. When Ohio State visits, turn up the volume from rowdy to ridiculous. This will be the eleventh game I have seen between the Buckeyes and the Badgers, and the contests are always a national event. This one was no different as College Gameday set up its stage on Bascom Hill to highlight the game’s magnitude. Indianapolis has been a familiar spot for the Badgers and it undoubtedly will be the same way for Ohio State in the future. Wisconsin arrived making its third appearance in the Big Ten title in four years. The Buckeyes were looking at capturing what slipped through their fingers in last year’s loss to Michigan State. But, the stakes were higher as a college football playoff spot was also in the cards for OSU. An undefeated bunch of Buckeyes. A Badger team headed to Indianapolis in two weeks to play for the Rose Bowl. Sounds like a matchup with a lot riding on it. Wrong. Ohio State is 10-0, but ineligible due to off the field hanky-panky. Wisconsin technically fell into 3rd place in the Leaders Division, but won it by default because the two teams ahead of them had the NCAA breathing down their necks. So, this game is for pride. Good thing they hate each other. 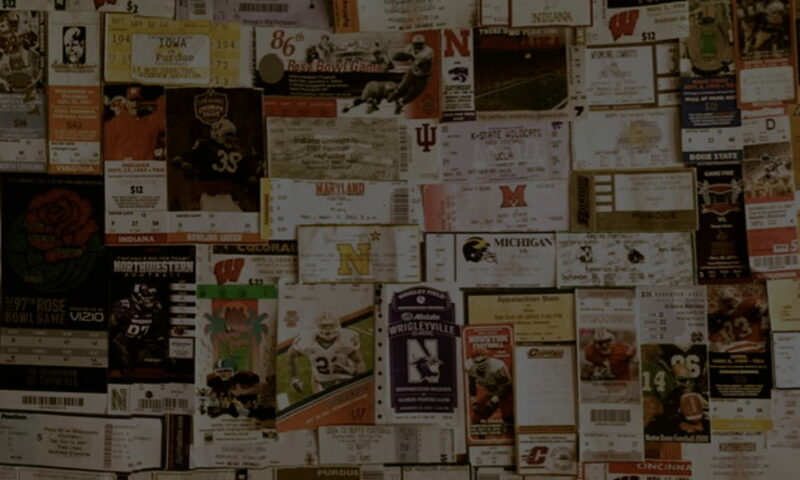 Camp Randall was overflowing as usual in hopes that Sconnie could tarnish the Bucks’ perfect season. Plus, everyone in the Big Ten wants to make new head coach Urban Meyer run for cover. It’s a passive aggressive jealously thing. The entire sports world seemed to be focused toward Madison on the night the Badgers upset #1 Ohio State. A heap of notable sports celebrities added to the attendance numbers that crammed Camp Randall. Chris Fowler, Lee Corso, Kirk Herbstreit, Desmond Howard, Erin Andrews, Scott Van Pelt, Michael Finley, and Ron Dayne names a few of the attendees that only amped the wattage on the spotlight that tilted toward this matchup. As if Madison wasn’t electric enough, include College Gameday live from the stadium, a night game toward a top ranked hated rival, and an opening kickoff returned for a touchdown that vaulted Wisconsin toward a 21-0 lead in the first half. Dodging bullets may be the name of the game this year if your team is in the top five and a national championship is a main goal. This season has been one of many mishaps by upper echelon football squads. Being in the top five is about survival, not about dominance. Many teams who have found their way into this elite range have fallen, but not the Buckeyes. Yes, their schedule may be weaker, but upsets have been coming in all forms this year and no game is a gimme. The Badgers charged into Columbus riding a three game winning streak in Ohio Stadium, so an upset certainly wouldn’t be a fairy tale in this matchup. Northwestern probably wishes there was a “CNTL, ALT, DELETE” function on this football game. Is there any way we can start over? Perhaps they wish this could be granted for their entire season. With all the trouble the Wildcats have had this year, their matchup with #1 Ohio State would have to serve as their bowl game. With the top ranked team in the nation, all the national attention, and equal amount of fans from both sides, the atmosphere emoted a bowl-like feel. Actually, it felt more like Chicagoland’s personal Ohio Stadium. The gross amount of Buckeye fans drowned out the flecks of purple. The fair-weather nature of the Wildcats fans was purely embarrassing. Eleven years ago, I was fortunate enough to witness the Badgers upset Ohio State at Camp Randall Stadium. The weather in Madison that day was chamber of commerce quality. Ever since that momentous victory, Wisconsin has had four opportunities and failed each time to defeat the Buckeyes at home. Each one of those losses took place amidst dreary, cold, and uncomfortable weather. Is it possible that the conditions outside serve as a harbinger for the outcome of this game? It’s not like Ohio State needed to show off. 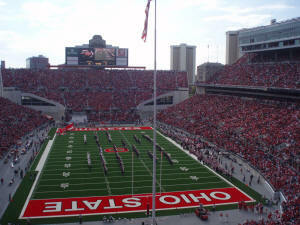 Their swanky number four ranking, glossy undefeated record, and star tailback Maurice Clarett impressed any onlookers. Still, the courageous and gargantuan Buckeyes strutted into Camp Randall Stadium prepared to play. Not even two minutes had been erased from the game clock – hardly enough time for Badger butts to warm the cold, metal bleachers – and Ohio State receiver Michael Jenkins hauled in a pass from Craig Krenzel, spun off a Badger defender, and sprinted solo forty-seven yards into the end zone. He made it appear as though one Buckeye player could single handedly defeat Wisconsin. After that play, I recall turning to my group and remarking on how that play defined how a top five squad should look like. The Badgers were far from such a lofty distinction since after winning five in a row, they coughed up two hairballs against Penn State and stumbling Indiana. With this inauspicious start, it was hard to imagine anything greater than an 0-3 Big Ten debut.